UCC employees fall into one of three payroll categories: student employees, part-time hourly employees, and full-time employees (administrators, classified, and faculty). The payroll schedules for student and part-time hourly employees are identical, and already include a “payroll lag.” This type of schedule, also known as “payment in arrears,” is widely used in the United States and is considered a payroll best practice. The payroll schedule for full-time employees at UCC has evolved over the years, but has never included a payroll lag. This type of payroll schedule is also known as “current basis.” With current basis payroll schedules, employees are paid for work done in a pay period on the last day of that pay period. Current basis payroll schedules impose several significant disadvantages to both employee and employer and are not considered a payroll best practice. These pages describe the method UCC will use to change the payroll cycle for our full-time employees to a “payment in arrears” cycle. Throughout these pages, the term “payroll lag” is defined as a delay, of up to one full pay period in duration, between the end of a pay period, and when pay for that period is made available to employees. The delay introduced by the payroll lag allows employees to submit their time sheets after the close of the pay period, and provides time for payroll processing tasks to take place. Why Implement a Payroll Lag? After an employee submits a timesheet, there are multiple processes which must be completed before the employee can be paid. For example, the timesheet information must be reviewed by the employee’s supervisor. If there are errors, the timesheet is returned to the employee for corrections and then re-submitted to the supervisor. With the supervisor’s approval, the timesheet must be processed by the Payroll department, electronic funds transfers must take place, and, in some cases, paper checks must be printed. A payroll lag provides the time for all of these activities to take place. 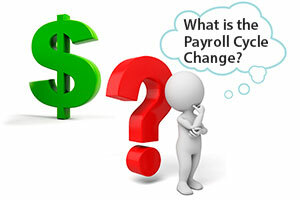 Our current payroll system does not provide a lag period. This introduces several problems. Employees must turn in their time sheets before the end of the pay period. In order to receive their pay on the last day of the pay period, the processing steps must begin before the end of the pay period. This leads to errors when unexpected absences occur, and extra work for the employee, who must file a paper form to report the unexpected absence. Extra work for supervisors and the Payroll department. When unexpected absences occur, the paper form reporting the correction must be approved by a supervisor and then processed by the Payroll department. Compliance issues relating to inaccurate payroll records. Our Banner system does not permit changes to a pay period that is in the past. Therefore, when a time sheet correction must be made, the correction appears in a later (and incorrect) pay period. Along with addressing the problems inherent in our current system, transitioning to a payment in arrears pay cycle allows UCC to improve payroll reporting and payroll processing efficiencies, and take steps toward improved fiscal health.